Want to build wealth but don’t really know where to start? If you knew where and how to start, would anything else be holding you back? What about fear or lack of money? For many people who want to build wealth, not having a lot of money upfront is often the biggest obstacle. When you’re living paycheck to paycheck, it’s difficult to squeeze out extra money to build a nest egg or invest in your future. When you focus all your time, energy, and money on the now, it’s almost impossible to do anything to make your future better. Building wealth is still very important, and you shouldn’t let lack of funds deter you from reaching financial stability and preparing for financial independence. Here’s what you can start doing if you want to build wealth but have a low budget. This is probably the most important thing you can do to build wealth. When you live below your means and spend less than you earn, there will always be something left over each month. It’s a guaranteed way to make sure you have extra money to save and invest for the future. However, it’s easier said than done. If you find that you’re spending more than you earn, you need to create a realistic budget you can stick to. Lower some expenses to make sure you have some extra cash flow. For me, this means keeping my cost of living low. I prefer to keep my housing expenses at way under 30% of my income, I drive a used car, eat at home most nights, shop for sales and discounts, and compare rates to make sure I’m getting the best deal. If you find that living below your means is difficult, that means it’s time to increase your means and earn some extra money. Imagine what you might be able to do if you could make an extra $500 per month. It could open you up to a world of opportunity when it comes to building wealth. If you’re trying to build long-term wealth, time (not money) is going to be your best friend. You need time to allow interest to compound on your investments. You also need time to save up money for that real estate purchase. When you start taking action earlier, you have a better chance of building wealth even if you don’t have a lot of money to contribute. Consider opening an online brokerage account with a robo-advisor like Betterment to start investing. I started with just $100/month which is an amount I think most people can afford if they watch their other expenses. You can also use apps like Acorns to invest spare change or Stash to start investing with as little as $5/week. If you can contribute to a 401(k), agree to have your employer deduct something from your paycheck to put in your account even if it’s not as much as you wanted to contribute. Again, the key is to start working on your plan now while time is on your side and not when time has already passed you by. The great thing about not having a ton of money is the opportunity to start making more. Today, there are so many options to make money flexibly thanks to the internet. There’s almost no reason why people shouldn’t be able to make some extra cash on the side. If you’re looking to use your side hustle income to build long-term wealth, the trick is you’ll need to establish a scalable source of income. While side hustles like driving for Uber or Instacart, babysitting, or even walking dogs are nice, you have to continue working in order to make money. If you want to make more, you need to contribute more hours of your time plus more energy. With a scalable income source like a small business, you can grow your income without having to grow your commitment as well. For example, consider doing something to make money where you can eventually outsource and get a team to help you. As long as paying for help doesn’t exceed the money your bringing in, it could be worth it and allow your small business to grow. Plus, with the right kind of help, you can continue earning money without your direct involvement. This allows you to create and manage multiple streams of income necessary for wealth building. The average millionaire has 7 streams of income. This wouldn’t be possible without the ability to scale. 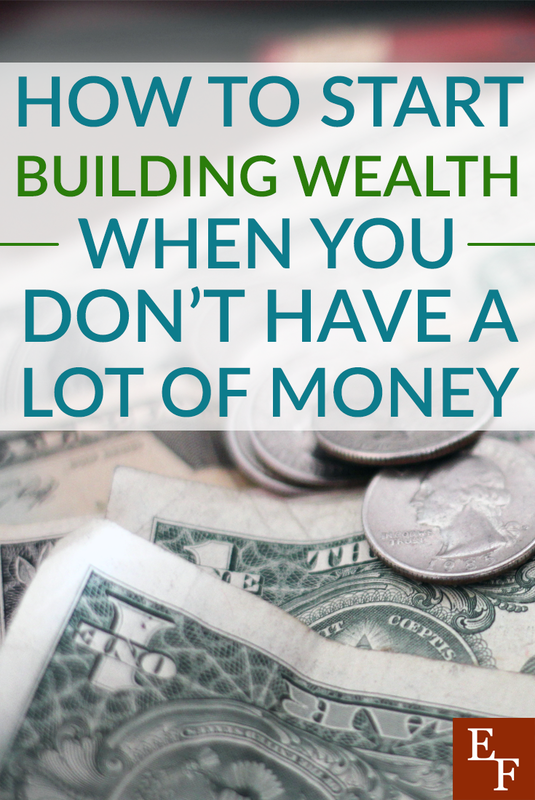 Debt can have a lot to do with your inability to be able to build wealth. Debt is so common in our society, and many people believe they must get into debt in order to fund their lifestyle because they don’t have the money to do so. A vicious cycle of debt is created afterward and it’s hard to escape. The truth is, most people who think they’re broke probably wouldn’t feel that way if they didn’t have debt. All those little payments add up each month so when you start getting rid of them, you’ll free up more of your income. Think about it. That $400/month car loan is $4,800/year. If you bought a car in cash, you could pocket that money instead. The same goes with student loans. While it made sense to stick with my low monthly payment of $140/month, I decided to pay off my student loans early and saved thousands of dollars in the process. Be remaining debt free, you’ll start to find the money to build wealth in your budget so long as you do a combination of the steps mentioned above. Building wealth is not just for the rich. If you’re able to live below your means, start early, avoid debt, and diversify your income, you can do it just like anyone else. What are you doing to build wealth right now?